SMSF’s are taking on more risks than they probably realise by investing most of their assets in Australia. They should reassess the way they allocate assets after taking into account their risk tolerance to reduce the consequence of losses when local markets correct. SMSF assets jumped almost $10 billion to $553.7 billion over the December 2014 quarter, up 23% from two years earlier, according to data from the Australian Taxation Office (ATO). Of course, this is not the asset mix of the average fund and it’s likely that a large percentage of SMSF’s have their assets concentrated in just one asset class. We believe that the reasons for SMSF’s concentrating their assets in Australian equities, cash and property are as follows. Investors have been chasing high dividend yields, especially when combined with franking credits. Many investors have probably never experienced a major market downturn. We know from history that equity markets fall by about 50% once every 10 years. Unfortunately, we can never predict the year of the next major fall, how long it will last and how long it will take to recover. Furthermore, many of these investors have probably piled into the market after the first few years of the bull market since 2008-2009. These investors were probably burnt during the last major crash in 2008 and have been trying to avoid risk. The problem for them is that the RBA’s target cash rate is now 2.00% and may fall further. 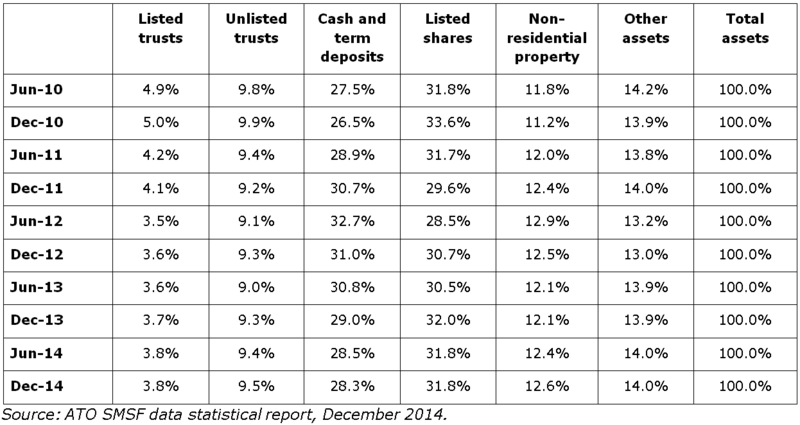 Property asset values are less volatile than share asset values. Because share values change every day, they appear to be more volatile than property values. Most properties are only valued once a year and valuers, being paid by property managers, have a vested interest in ‘smoothing out’ fluctuations in property values. This point is illustrated by the fact that values of listed property trusts are far more volatile than the valuations of the underlying unlisted properties. Property is less liquid than shares. Investors should demand a premium for this lack of liquidity over shares, which is currently not available. In addition, property promoters constantly spruik investments in off-the-plan property developments, which are even more risky than normal unlisted property. This is because the investor accepts what is known as ‘construction risk’, the risk associated with building the property, for which the investor does not receive an additional risk premium. Furthermore, many trustees feel they have been let down by traditional investment management when markets have fallen. As a result, they mistakenly believe that by taking direct control of their own investments, they will receive a better outcome. In reality, their financial adviser, if they have one, has not properly engaged with them in determining their risk tolerance and they have likely gone missing when markets crashed. By properly engaging with their clients, a financial adviser can help ensure clients receive the investment returns to which they are entitled and, despite periods of market uncertainty, have a successful investment experience. Such a high level of investment in property and shares is probably much more risk than is consistent with SMSF investors’ risk tolerance or financial needs. SMSF’s are saving for retirement and such a high exposure to growth assets involves more risk than they need to meet their cash flow. Good investment advice can help to minimise this risk. At the very least, advisers should be testing the risk tolerance of SMSF’s to determine suitable investments for their clients. Geographic diversification is also important. There are unlimited opportunities to diversify SMSF exposures across different asset classes and geographies, thereby reducing investment risks. The benefits potentially include stronger returns. Global markets have, in aggregate, outperformed Australian markets over the past 3 years and the fall in the Australian dollar has magnified returns. If the Australian dollar continues to fall, then we could see even further gains from international shares. Most SMSF investors are currently missing out on these gains. Paul Resnik is a co-founder of FinaMetrica, provider of psychometric risk tolerance testing tools and investment suitability methodologies to financial advisers in 23 countries. Paul has 40 years of experience in the financial services. Peter Worcester is an actuary who also has 40 years of experience in financial services, and he was a key witness for the Joint Parliamentary Committee investigation into Storm Financial.